it's a great week-end to start pruning! February (and March) are good times to prune. I don't get the prune-shrubs-into-a-ball-shape thing. On thinning and rejuvenating shrubs. January - gardening fever starts again! So holidays are over, it's nice outside (right now), and I can't think of anything better to think about than gardening planning for 2012. What, it's not just me, right? Are you there yet? Dreaming of big, exciting garden renovations for 2012? I am so there. I have some pretty major plans for this year, starting with taking down 2 spruce trees at the back of my Adventure Garden. Above: here's my Dad yesterday after we had removed the lower branches from the 2 doomed trees (I'm holding the rope!) Not to worry, I am a tree hugger at heart, and I have plenty more trees in my garden. These two particular trees were planted too close together, too close to a retaining wall, thus they were ratty and scraggly looking, (not to mention, of course, they were stealing too much sun and moisture from the garden.) I don't think you should ever feel bad about taking down a tree that someone else planted in the wrong spot. These two trees will be replaced with a large lilac and some shrub roses in spring, which are hardy and drought-tolerant, will provide privacy, and will help screen the view of that utility pole back there. ... and now I have a big mess on my back lawn to get rid of. I see a chipper rental in my future! Meet Clive, the flowering clivia. Clive doesn't look very Christmasy with that brassy orange colour, but at this time of year, when the christmas cactus has finished blooming, I'll take just about anything! I LOVE flowering house plants (I NEED flowering houseplants!) and this is a plant that I expect to get better with age. I ordered him from Garden Imports in spring 2010, after someone on GardenRant had been raving about clivias. May it be yours this holiday season and throughout the coming year! I look forward to virtually gardening with you in 2012! Yes, gardening and plants (and taking down spruce trees - exciting news coming on that front! but no, sadly, I didn't lose any in the windstorm) are always at least in the back of my mind even if I don't always have time to post about it. This is a busy time of year at work (@ Mount Royal University - the marking! the meetings!) so I'm going easy on myself - expect just a few posts this month as I focus my time and energies on family and holiday festivities, and then the blog will start up with regular posts again in the New Year. Have a wonderful, festive December, everyone! ... plus fog and snow for the last 10 days straight. Very uncharacteristic for Calgary! This is according to a farming friend of mine who actually keeps track of these things better than me. So I'm finished my semester-from-hell at work. Christmas mayhem is about to descend on our house, and then I'll have time to start posting again. Regularly. Once a week at least. I promise! But right now it's time to go enjoy Christmas with a 7, 4 and 3-year-old and hubby. Joy! I'm actually not a very keen houseplant person (they get neglected all summer while I'm outside), so the few houseplants I actually do own have to be extra special: anything that is easy to take care of, yet flowers, is definitely a worthwhile houseplant in my books! I also have a Meyer lemon tree which I acquired this past spring. It took a while to get settled in its new pot but seems to be doing OK now. It is everbearing so always has flowers on it - which smell AMAZING! I have yet to harvest a decent lemon but it's worth it just for the flowers. I can always hope for future lemons since it's early days still. I've also heard that these plants are fairly finicky about their moisture requirements... I'll have to do some research. Anyone have any tips for growing Meyer lemons? thank goodness for flowering house plants! I'm not dying for spring quite yet but I sure do love having flowers around the house! But before that, must get ready for Christmas! In the absence of actual gardening that needs to be done, I manage to find a little time for sewing in December. Making gift bags is my thing. What do you do to get through the winter months? Sigh. This is a busy time of year for me. I can barely remember what it was like to have spare time to think about the garden... I still don't have time to write much, but I hope to get back to it in a few weeks when work isn't so hectic. In the meantime, here's a Christmas ornament I made over the week-end. I got the idea from my Mom's Harrowsmith magazine, and I think these are lovely! They're simply lamb's ears (the plant! ha ha) glued onto a styrofoam ball. I wish I had more plants to harvest more leaves from - I only had enough to make 2 balls, and since my kids insisted on "helping", I only ended up with one nice one (or maybe I should say adult-quality). Wouldn't a bunch of these look nice in a bowl, maybe with some berries or red twigs? ... and update: here it is in a place of honour on my mantle. I know I said I was too busy to post but I couldn't resist posting this picture of my christmas cactus blooming its heart out - it obviously likes my sunroom because the last few years it has burst into so many flowers I've been afraid it would bloom itself to death! But it even reblooms (though not nearly as heavily) in late winter. This plant is at least 7-8 years old. Thank goodness for flowering houseplants! So, long story short, I'll start posting again in a couple of weeks once I get over this hump. I gotta say, I love that my work is seasonal and the busy times occur in the winter. If I was this busy during gardening season I would lose my mind!!! PS I stole one more bag of leaves this week ... anyone interested in starting a Leafaholics Anonymous group? winter ain't over 'til it's over! I have trained myself not to expect to garden until the end of April - then I'm not disappointed when these late snow storms and cold snaps come. I also have little seedlings growing in the basement so I feel like I'm gardening a wee bit. I'm still planning and prioritizing what I want to get done in the garden this year. My gardening time is primarily in the early morning, for up to an hour or so some days before the kids wake up. It's still too dark and cold that early in the morning, so I couldn't really get any gardening done at this time of year anyway! And finally, moisture is good! This has been a great year for snow cover in Calgary - my garden has been covered with snow since mid-November. I don't know if the snow was thick enough to insulate much from cold temperatures, but at least it prevents our dry winds from sucking the moisture out of the soil all winter long! Last year at this time I actually watered the garden because it had been dry and exposed for so long. April 27, 2008 - Fierce snowstorm closes the Trans-Canada Highway in northwestern Ontario and eastern Manitoba. April 21, 2008 - 24 cm (10 in) of snow falls in Nanaimo, B.C., before noon. April 19, 2008 - Saskatoon awakens to a fresh blanket of snow. 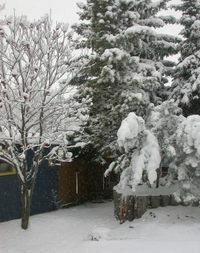 April 14, 2008 - Deep freeze hits the Okanagan, decimating the tender fruit crop. April 2, 2008 - PEI greeted by new snow on Easter Sunday. April 8, 2007 - It was Montreal's last storm of the year, but it was a doozie! April 14, 2006 - Whitehorse sees more snow in three short days than would normally fall all month. April 5, 1999 - No less than 68 cm (27 inches) falls in St. John's, still a single-day record in Newfoundland's capital. what can you do in a Calgary zone 3 garden in mid-March? If you're like me, this recent bout of warm weather makes you itch to be outside. Judging from traffic on my blog, a lot of people are wondering what they can do in the garden this week-end. Sorry, not much. This is Calgary, after all! I've gardened here long enough to know not to get excited until at least mid April! And if you really need to get out and putter, a little pruning now would still be a good idea. Just don't prune spring flowering shrubs (eg. lilacs) because you will cut the future flower buds off. And stay off any soggy areas - stepping on a wet garden is a big no-no because it compacts the soil. my last winter project is done! So, winter is a time for other pursuits. I like to make some Christmas decorations and presents for my daughters and niece and nephews every year. I also catch up on my photo albums. Above you can see my most recent, and last, project of this winter. Some good friends gave us some hand-me-down girl's furniture a year and a half ago, and I promised my husband I would finally paint it up and get it out of the garage before spring. Hence, I have been painting up a storm. Thanks to the fact that I used so many colours, and that our laundry room is only big enough to contain one piece of furniture at a time, this project took a month to finish. But it's done! Hallelujah! I just can't get enough of my gorgeous amaryllis blooms! The vivid colour jumps out at me even when I glance in their direction from another room! What a great way to perk up the February gardening blahs. Unfortunately, I planted them in early November, which was too late to get Christmas blooms (which is what I initially intended), but I guess I have Valentine's blooms instead. Next year I'll plant the bulbs earlier, but it's still a gamble getting blooms for Christmas. I'll probably plant them anyway, but splurge on a few from the florist in December as well. I couldn't decide on just one picture so here are my faves. Enjoy! It's usually about this time of year that I start yearning for spring, flipping through my gardening magazines and books, hungrily staring at pictures with green, growing things in them, and making plans for the coming season. But to be honest, I'm not there yet. I have a few more projects I want to get done inside first. These are the sorts of things I never have time for once gardening starts. One of them is to get caught up on the family photo album. This year I'm using a combination of Picasa 3 and Corel Draw to make my scrapbook pages. Each year I take a couple pages to record what I did in the garden. Here they are! We had to laugh at ourselves this past week-end as we brought the tree into our house. It was a tall pine tree out of the backyard that had to come down anyway, so we saved it until now. It was about 25ft tall, so of course some of the branches snapped off as it came crashing to the ground. Here it is looking a little lopsided and flattened as my husband chopped off the top 8ft to bring inside. While maybe not the prettiest, it's certainly the tallest tree we've ever had! With all the cold temperatures we've been having, it was close to impossible to get any of the snow and ice off the tree before we brought it into the house. And thanks to the fact that it was frozen solid, it was almost impossible to get it in the door despite the fact that it had lost several branches and looked very flat! But half laughing, half cursing, we brought it in anyway, dropping pine cones, needles and snow everywhere, and let it drip on our floor for an hour. I have said it before - I love winter! People always seem to be surprised to hear me say that, considering how much I love to garden. But really, gardening is such a passion for me that during the 6-7 gardening months, I never get anything else done! Nothing. I even admit that I neglect my husband during that time! So I am thankful for winter for the chance to do other things. One thing I like to do is make a few presents for my kids, niece and nephews. Here are the bags I made for my two older daughters and niece this year. Could they be any more sparkly? And here are the toyboxes I made for my young nephews (the girls have already received toyboxes in previous years). I got some plain, $20 toyboxes from Ikea, painted them up, and put on a pillow top. Easy peasy! Now how am I going to wrap them....? This year, for our "annual girls' craft night", we made pine cone wreaths. This would have been a fun craft to do with the kids if I'd been organized to go collecting with them before it snowed... The kids already like to bring sticks, dried leaves, pine cones etc. into the house, why not have a little scavenger hunt and then let them use their treasures to decorate a wreath? It would be a great way to recycle some old ribbons and ornaments as well. Mine ended up being quite simple, but I like it as a backdrop for other Christmas decorations on the mantle in our living room. It has been -30C in Calgary for several days now (that's -22F to you Americans!!) so I didn't even venture outside to take pictures of the garden covered in a beautiful blanket of fresh snow. I can't complain - at least I have power, unlike parts of the eastern US right now. And if it has to be cold, at least there is snow insulating the garden. Here's my Christmas cactus which started blooming a month ago and is still going strong. ... and the jade in my daughters' bedroom is looking very pretty. This is the second year it has bloomed. Unfortunately, the amaryllis we planted Nov 10 has only just started to sprout. Looks like maybe I'll have a "Valentine's amaryllis" this year. Mental note to plant them earlier next year! And here's one last view of the garden from the warmth of the dining room. These are my willow chairs and table sitting in front of the doomed greenhouse. Everything looks nicer with fresh snow on it!! Here is the same view I posted a picture of 2 days ago for Garden Blogger's Bloom Day. I took it on the way to work so sadly it was dark at the time (but it's also dark when I come home so I really had no choice). This was part of my backyard this morning (april 10). If you're new to Calgary, don't worry! The perennials will be fine!! Even the trees will be fine. It's when it snows in May or June that you have to worry - the leaves on deciduous trees will hold the snow and you'll want to run out and shake them off before branches start falling off. - if your garden doesn't look as good as you'd hoped, you can always blame it on the weather! !